Here’s my idea for a inexpensive stocking stuffer or Secret Santa gift. 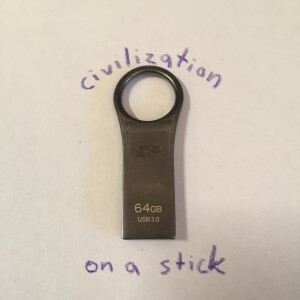 Take a bunch of the greatest works of literature that are now in the public domain, load them on a USB thumb drive, and give Civilization On A Stick. I’ve made it even easier for you; with this Dropbox Folder you can just copy my list of 131 works, from Aeschylus to Austen, straight to your thumb drive. I created this preliminary list from the wonderful Project Gutenberg library of public domain books. I’ve included each book in both .epub (open source) and .mobi (Kindle-friendly) format. My entire folder of 131 books in two formats is just 230MB, it can easily fit on an inexpensive thumb drive. You can get a ten pack of 2GB drives on Amazon for $26, or $2.60 each. These would fit about 1000 books each. Why stop with my list? Make your own create a library that you can carry on your keychain and would be the envy of anyone born before the first World War. Here’s my list, alphabetized by author.